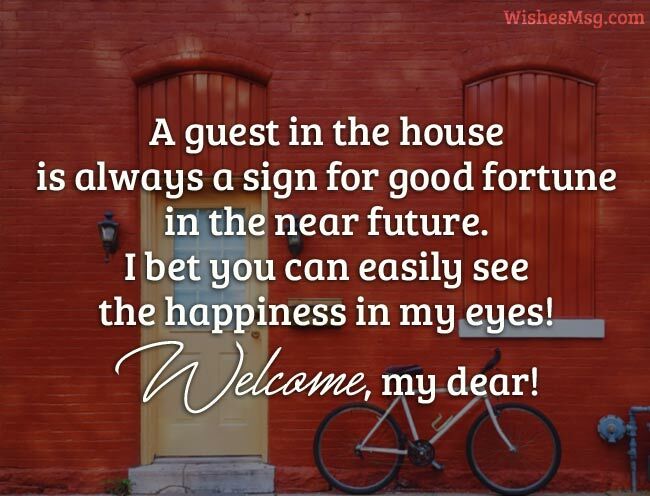 Welcome Messages are important to let someone know how happy you are to see him/her joining you at your house or at your workplace. Perfect welcome messages are rare to be found on the internet. This is why we have brought for you, a collection of some extra-ordinary welcome messages. These sample welcome messages can be great to express your happiness, delight and surprise. 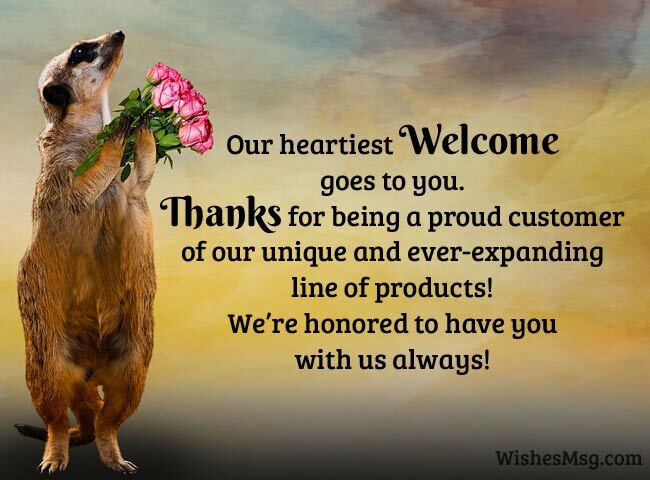 Be it a guest at your house, or a new employee at your company or even a customer of yours, you can win the hearts of everyone with these welcome messages. 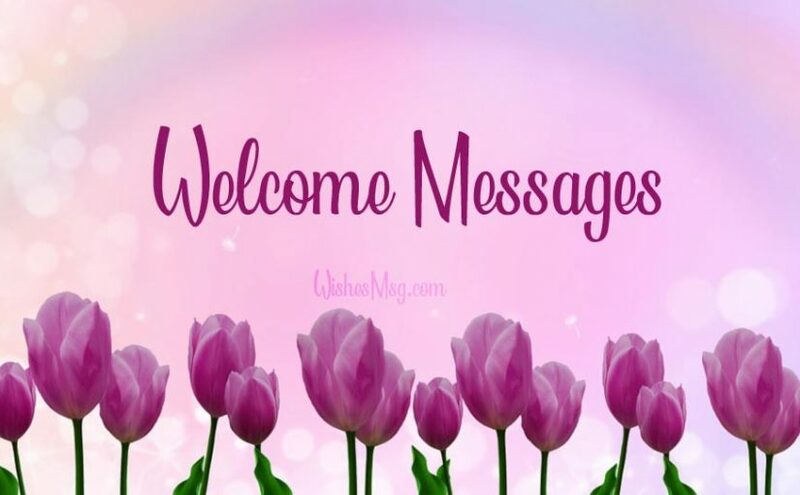 Make a perfect first impression with these welcome messages! We have waited so long to have you among us. At last, the time has come. We are most delightfully welcoming you to join us today! You are a wonderful person with a wonderful view of life. Your companionship is always an opportunity to learn. A warm welcome to you to join us! Life seldom gives a chance to know someone who can influence us so deeply. I’m lucky to have the opportunity to meet you! Welcome into my life! I’m so glad to welcome you to my [new] house. Your presence in our [new] home is nothing less than a blessing to us! Only a few people can touch our hearts so deeply yet so gently. You are among the few. I am so honored to be able to welcome you among us! We have learned so many things from you. It’ll be great to have you with us, sharing the same journey, by the same road. Welcome! The times we spend with you is always so full of joy and happiness. Knowing that you’ll be with us, brings the smile on our face. Welcome to our house! Spending time with you is more enjoyable than watching a football match live in the stadium. We gladly welcome you to be with us in our house. We are very delighted to welcome you as a new member of our company. We strongly believe that your skill and knowledge will help us achieve what we aim for! Welcome abroad, Mr. [Name]! You are one of the most talented and resourceful candidates we have hired so far. We hope you’ll do some amazing works here! The entire team of [name of the company] is honored to welcome you on board. Enjoy the facilities here and make sure your talents are fully utilized! Having you in the company means a lot for us. We hope you’ll make the best use of your skills and knowledge and make sure something great is achieved! We are really so eagerly waiting to have you working with us. We believe, together, we can do something extraordinary for the company! An employee like you; youthful and so full of energy is an asset for a company like ours. We can’t wait to start working with you! Welcome to our company! We are nothing without customers! Welcome to our [new] shop where you’ll find everything you want! Your presence is our motivation to do better! Our heartiest welcome goes to you. Thanks for being a proud customer of our unique and ever-expanding line of products! We’re honored to have you with us always! We know the value of each penny you spend on buying our products. We appreciate you for trusting us! Satisfying your needs is our mission. Welcome to our [new] shop! Your trust is our asset. We express our deepest gratitude for supporting us and welcome you to be a part of our global community. We get better with every customer we deal with. We grow by satisfying your needs. We welcome you to be a part of our proud family where every customer is a king! Let us welcome you with the warmth of our hearts as we introduce our new product to the market. It’s your time to be a proud owner of it! Having you with us in our house is a matter of great joy and comfort. We look forward to sharing some incredible moments together! Welcome to the house! We are very happy to see you. We all eagerly wait for this time of the year to have you among us. Welcome to our happy family! You’re one of our most favorite people in the family! The moments we spend with you are always full of fun, wisdom and joy! Welcome to our house! Sometimes all you need is an awesome guest to make you feel complete in the family. I am really glad to see you. Welcome to my sweet home! A guest in the house is always a sign for good fortune in the near future. I bet you can easily see the happiness in my eyes! Welcome, my dear! If you want to spend your holidays in the best possible way, you either be a guest or host a guest! I’m more than happy to do the later one. Welcome, to my house! Sometimes the most amiable people turn out to be sociopaths. You really should have thought twice before deciding to be my guest. Anyway, Welcome to my house! I really want to apologize if my ‘Welcome’ message sounds like a ‘Go away’ message to you. But we welcome every guest with a machete. It’s our family symbol! If you think being our guest will make the best vacation for you, you’re wrong. We are looking for a dishwasher but a guest would do just fine! Welcome! Welcome to my house. I’ll treat you well if you promise to never be my guest again. Just kidding, I never treat my guests well! Sometimes in life, you have to spend your time and money over a person you never planned to. 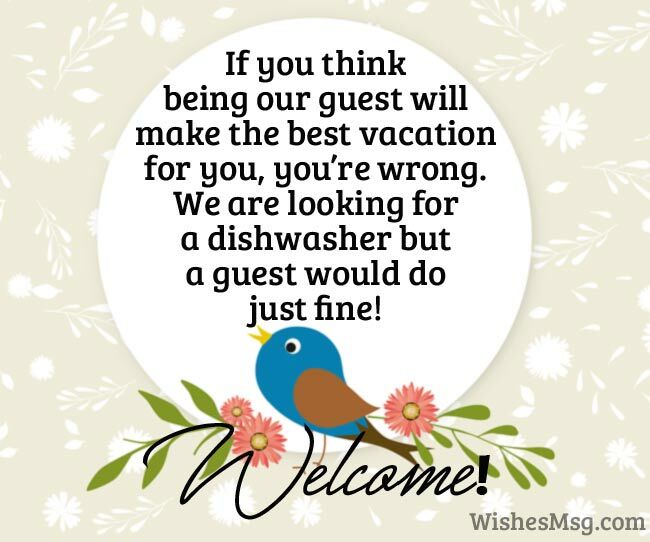 The person is called a Guest! Welcome to my house! Whatever trouble you cause me this time, will be repaid when my turn comes to be your guest. So be gentle and be nice. Welcome to my house! The first impression is very important because it defines all the later part of your relationship with someone. These welcome messages are priceless when it comes to making a perfect first impression while welcoming someone!